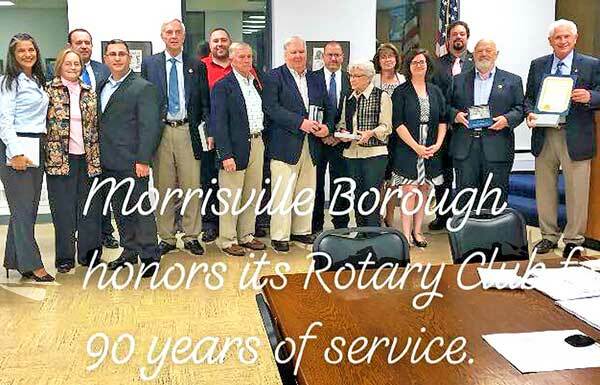 The Morrisville-Yardley Area Rotary Club - Times Publishing Newspapers, Inc. It is one of the largest and oldest worldwide service organization in the world with 1.2 million members and 52,000 clubs! It offers fun, fellowship, networking and service opportunities both locally and globally. Rotarians emphasize ethical conduct in personal, professional and business relationships, using the “4-Way Test” as the standard. For the Morrisville-Yardley Area Rotary Club, much of the action starts with the regular evening meetings on the second and fourth Thursday of the month at the Yardley Country Club. Their members typically enjoy a great buffet, mingle, listen to speakers talking on interesting topics and make plans for service projects and fundraisers. The club motto is “Service Above Self” and it serves the community through its own projects and by working with other organizations and schools, with special emphasis on education. The club and its members support and have supported many international programs, including its own clean water project in Peru, and the massive fight, initiated by Rotary, to eradicate polio from the face of the earth. Various fundraisers, including Country Breakfasts, help support the service activities. For specific meeting schedules and other Rotary information, go to the website, MyRotaryPA.org, and find the club on Facebook. Or just show up at a meeting! All are welcome.